As much as you may dream about having a gigantically big and spacious bathroom, with a walk-in double shower, a lush jetted bathtub, and twin vanities with large sinks, sometimes this is exactly what – a dream! Unless of course you’re one of the lucky ones who hasn’t been blessed with an absolutely minuscule, European sized bathroom, which is what most of us have, but fear not – there are some unbelievably luxurious and luscious upscale bathtubs out there that will help bring your tiny little bathroom to life, and of course, some clever color and mirror tricks to help make your small bathroom look more spacious. Bringing in a lot of white to your bathroom, on the floors, walls, tubs and basins, will definitely open up your bathroom and create more chic look, but this doesn’t mean you need to completely ban color from your bathroom, in fact, bringing in color and contrast, as well as some lighting trick will help add some character and style to a bathroom that may look a little sterile with TOO much white. Mirrors are also a beautiful way to add some depth to your bathroom, as it creates the illusion of more space. These 5 bathtubs work so perfectly and gorgeously in small-scale bathrooms, giving you more space, whilst also adding that sleek and contemporary look you’re longing for in your bathroom. This bathtub has been perfectly named – The Daydreamer. We love the idea of sitting in a bathtub, daydreaming all day, don’t you?! Designed by the very talented Italian Massimo Farinatti, this freestanding bathtub will look absolutely breathtaking in any bathroom. Designed with extra deep seating, you can lay back, relax and really enjoy a full body soak, either by yourself or with the company, plus it’s been finished off with a classic, natural charcoaled wood bath rack. You can really spend the day in this tub, with a glass or a bottle of champers and some snacks. You can get these Daydreamer bathtubs in a range of 5 different sizes from 59.00 to 74.80 inches. One of our favorites lately is this absolutely gorgeous freestanding Lullaby bathtub. Created to perfectly suit a space-conscious and modern bathroom, this beautiful bathtub is extra deep, again – completely perfect for a nice long, full body soak on cold and rainy days, and with its ingenious and ergonomic design, it will feel as if it’s been tailor designed especially for your body! We love the matte finish on this Lullaby Freestanding Bathtub, and could definitely see this working in traditional and vintage style bathroom, or in a modern and stylish bathroom. 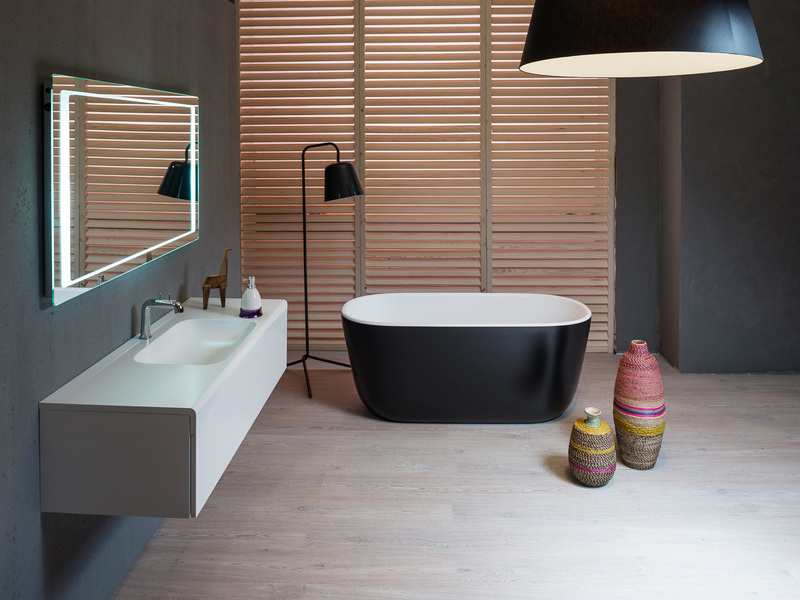 Remember what we were saying about bringing color and contrast into your bathroom, well this Mini Black Lullaby freestanding bathtub is just the right size for a really small bathroom, but with is gorgeously bold and sophisticated black outer finish and inner white finish you’ll create a classical yet very trendy looking bathroom feel. This adorable little freestanding tub is only 55 inches long, and is the “mini-tub” of the Lullaby version, but is still extra deep in seating, allowing you to enjoy a full body soak. 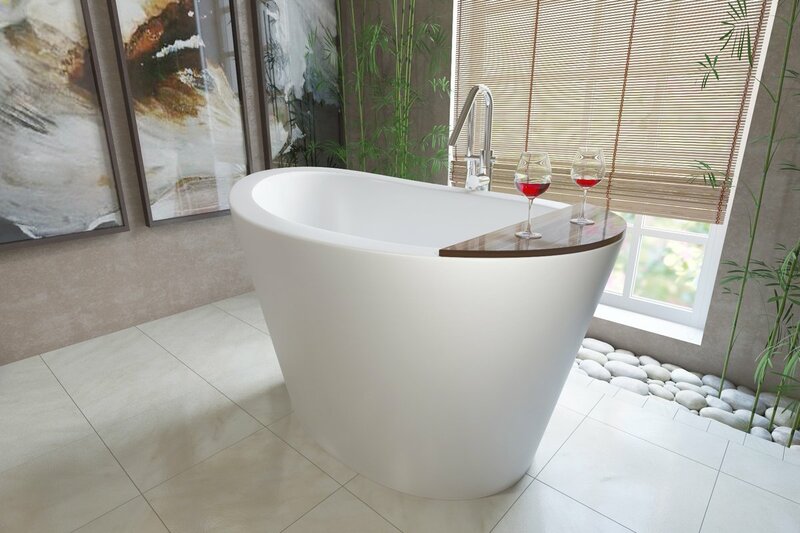 This uniquely shaped, freestanding bathtub is insanely striking and will definitely add a significant touch of style to your bathroom, with its silky smooth, white surface and beautifully designed shape. Pair this bathtub up next to a large window or mirror, and watch how you small bathroom transforms into a bigger and more spacious bathroom! This bathtub can be used by one or two people at the same time, and with the added wooden rack, you can enjoy your full body soak, with a refreshing glass of bubbly, a book or some good company. Remember, having a small and minimalistic bathroom doesn't necessarily always need to be a bad thing, as long as you have some creative juice flowing through your veins, a little bit of inspiration and time is all you’ll need to create a chic, trendy and gorgeously spacious looking bathroom – within a small space!